...a peck of purple peppers! I don't say very many things definitively (I'm a hemmer and hawer from way back), but I will state this: Purple is my favorite color. Now, don't ask me to specify a particular shade of purple--that ain't happening. But whether I'm picking out a marker, buying a new shirt, or deciding on flowers for our wedding, purple is and probably always will be my first choice. We got a packet of carnival mix pepper seeds, and I was delighted when the first color that emerged was purple. As it's turning out, it's the only color emerging*, but that's okay with me. I've been slipping the purple peppers into everything from pasta salad to barbecue chicken pot pie, and I finally decided that they deserved more of a spotlight. *It just so happens that I just reaped our first orange pepper, thereby making this an inaccurate statement. Cook green beans in boiling salted water to cover 3 to 4 minutes or until crisp-tender; drain well. Heat oil in a large skillet over medium-high heat; add bell pepper and sauté 4 minutes or until tender. Add green beans, vinegar, sugar, basil, salt, and pepper, and toss to combine. Cook for a minute or two, until the beans are warmed and the sauce has thickened a bit. Green Beans and Purple Peppers sound great! I bet it tastes amazing! Lol... Yes... you do need my purple beans to add to your mix! We planted those same peppers, but learned that we should have started our little seeds a little bit earlier. Glad you did better than we did! Honestly, i have never seen purple peppers like yours. 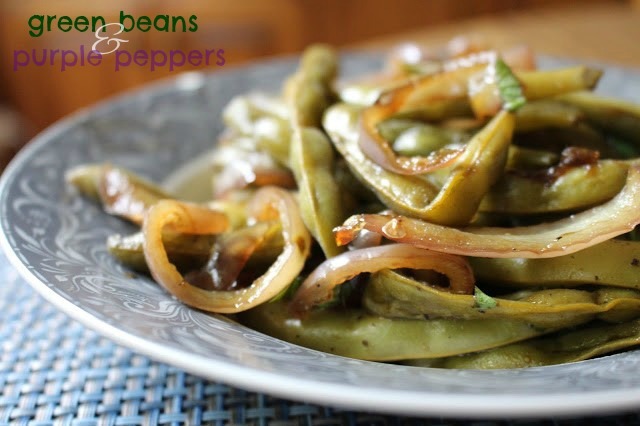 Green beans and peppers compliment each other nicely, what a great dish. You have a wedding coming up?? Did I miss a post somewhere?? So exciting!! Also, the peppers are gorgeous! First: Wedding?!?!?! Congrats! How exciting!!! Second: Purple peppers?!?!? How fun! Wow I have never seen purple peppers before! They are beautiful. And I bet this was even more delicious since it was home grown! A purple garden sounds just as marvelous as this delicious dish! Those purple peppers are really fun and beautiful. 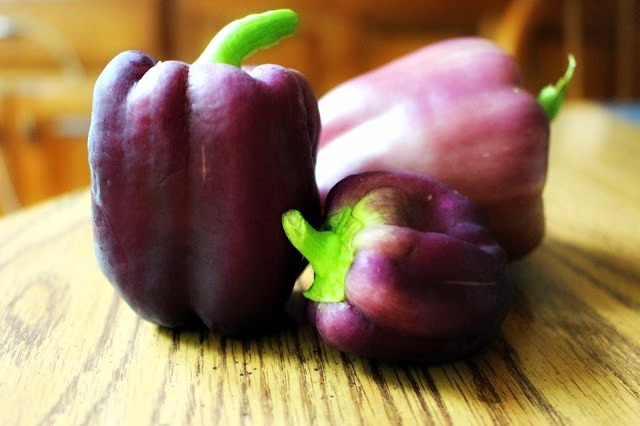 I love it when I can find purple peppers at the farmer's market! Now you just have to find purple green beans as well - they're out there! Purple peppers! You learn something new every day - these look both fun AND scrumptious! Purple peppers are so pretty! I wish they kept their color when cooked. An all purple garden sounds fantastic! I have never seen purple peppers around here but I bet they are so tasty! This is a great vegan dish Grace! Love the simplicity of the side dish. It lets the flavors of the homegrown veggies shine! Not a fan of peppers, but I adore green beans! Color makes everything better, don't you think? Ooh we rarely see purple peppers here so it would be such a treat having home grown ones! :D I love the sound of this dish and my mother in law is also a purple lover!